Age 88, of Jefferson Hills, lost her battle with cancer on Sunday, November 18, 2018. Born in Scranton, PA, on March 31, 1930, she was a daughter of the late Mary and John Benish of Duquesne, PA.
She married Peter J. Azzari in 1955. They celebrated their 62 years together on June 25th 2017. He preceded her in death on January 4, 2018. Marge was a loving mother, grandmother and great grandmother. Spending time with her family was what she enjoyed the most. She was hardworking and taught her daughters how to be strong willed women as she led by example. She always enjoyed speaking a good conversation in her ethnic language of Slovak. She enjoyed sewing and crocheting. Marge and Pete enjoyed traveling around the world. They have visited many parts of the United States, but their favorite excursion was their trip to their homelands of Czechoslovakia and Italy to visit relatives. She also enjoyed the games of chance at the casino and playing the daily lottery. She took pride in her abundant garden. She also dabbled in artwork, as she always mailed out her holiday cards to her family complete with her sketches decorating the envelopes. She proudly served as a Lecture at St. Paulinus Church in Clairton for 35 years. 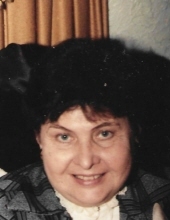 She was a past Vice President of the Slovak Catholic Sokol, Assembly 295 in Duquesne, PA. She was a Data Processor at U.S. Steel, Irvin Works Plant and Wetterau, Inc. in Belle Vernon. In her younger years, she enjoyed working at Kennywood Park as a waitress. She was a member of the Yankee Doodle Dandy Singing group, performing for area senior citizens especially during the holidays. She volunteered for many years at Jefferson Hospital in the Gift Shop. She is survived by her 4 daughters: Tina (Mike) Quinn of Sutersville; Corrine (Carl) Hancock of Elizabeth; Marcia (Fred) Bercik of Charleroi; and Annette Azzari of Peters Township. Her Grandchildren; Christopher (Jessica) Quinn; Brandon (Emily) Quinn; Kayla (Tim) Snyder; Marissa (Colby) Scullion; Kirstie Moore; Tyler Bercik. Great Grandchildren; Olive and Cole Quinn; Khloe Snyder; and her brother, John Benish of Maryland. She is also survived by nieces and nephews. Along with her husband, Pete, she was preceded in death by her parents, her sister, Mary (Benish) Schillaci; her brother, George Benish. To send flowers or a remembrance gift to the family of Margaret M. (Benish) Azzari, please visit our Tribute Store. "Email Address" would like to share the life celebration of Margaret M. (Benish) Azzari. Click on the "link" to go to share a favorite memory or leave a condolence message for the family.